Everybody could use a little more creativity to fuel their lives – so we’re kicking off a new feature here at MyRideisMe! In our Artist Toolbox series, we’ll introduce you to a new hot rod inspired artist and bring you a tutorial from the artist themselves. So not only will you get the opportunity to learn about some fantastic, creative geniuses – but you might learn a thing or two as well! Some people out there hear the word “art” and think of fancy-schmancy galleries and a bunch of stuffed shirts. Others hear “low brow art” and assume it’s something the wife wouldn’t allow hanging in the house. 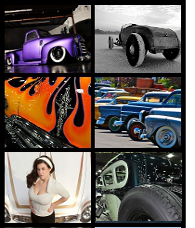 No matter what you think of hot rod art, you’re in for a surprise! 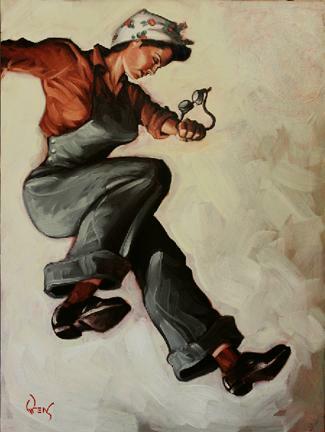 The artists we’ll spotlight in the Artist Toolbox series create high-class, fun, and hot-rod inspired pieces of beauty. They put the same sort of grit and heart into their works of art as we all put into our cars. MRIM Since My Ride is Me, which ride would you chose as most representative of yourself? MRIM Are you as artful when working in the garage as in the studio? MRIM Is painting your full-time day job? 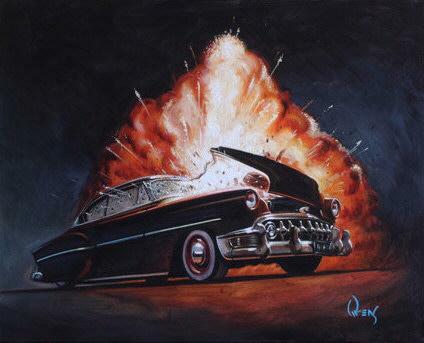 Read on, to see how James creates his car noir art in his tutorial, The Dame Wore Red. 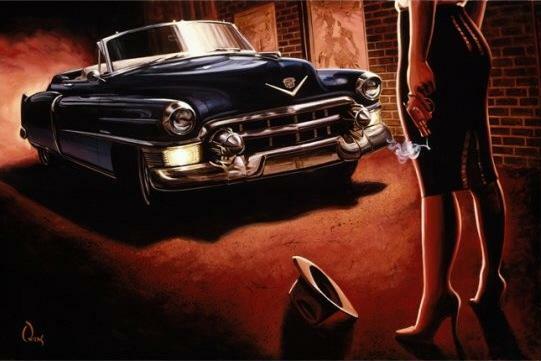 To check out more of his art or purchase some of your very own, visit James Owen’s on the web at car-noir.com. I love the Noir Influence in James art, they look like scenes from a Movie!